To help you with the math computations required for some of the Integrated-Reasoning (IR) questions on the GMAT, you’ll be provided with a simple calculator. 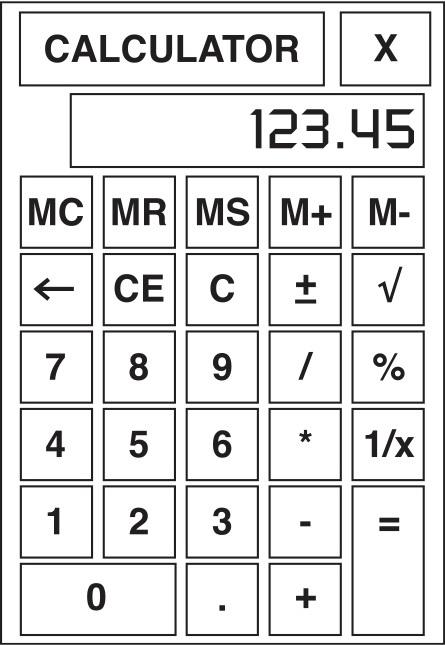 Whenever you need it, you click the box labeled Calculator and a simple calculator interface appears, as shown here. You select the calculator’s functions by using your mouse. Don’t get too attached to it, though; the calculator is available only for IR questions, so you won’t be able to use it in the quantitative-reasoning section. Because using a computer calculator can be awkward, you’ll likely answer most IR questions more quickly by using estimation or working out calculations by hand on your noteboard. Save the calculator for only the most complex or precise computations. The calculator looks a lot like one you would purchase at your local dollar store, or the one that appears when you access the Microsoft calculator accessory. It has minimal features but everything you need to work out the calculations in the IR section. As mentioned, when you click on Calculator at the top of your screen, the tool pops up. You can move it anywhere on the screen by dragging it with your mouse. It stays open until you close it by clicking the X in the upper-right corner of the tool. The number and operation keys work just like a regular calculator. You can clear a single entry with the CE key or just the right digit with the left-arrow, ←, key. Start over again from scratch by clicking the C key, which wipes out the entry and all its associated computations. Unlike a scientific calculator, the GMAT calculator doesn’t follow the order of operations. So if you enter 4 + 5 * 10, you get 90 instead of 54. To get the right value, you have to enter the values in the proper order, 5 * 10 + 4. The MS key stores a value to the memory. You can add values to the memory with the M+ key and subtract them with the M– key. To access the value in the memory, click MR. To clear it, click MC. The positive/negative (±) key changes a positive value to negative and a negative value to positive. The / key means divide, and the * key multiples. To find the square root of 34, you enter 34 and click on √. To find 35 percent of 70, you enter 7 * 35 and hit the % key. Though you probably won’t use it much, the 1/x key finds the reciprocal of any integer. To find the value of the reciprocal of 4, for example, you enter 4 and click the 1/x key—voila!—0.25 appears.